Staying in a spot when everyone else is coming and going, is not only unique but a strangely peaceful travel experience. You can do just that in Denver, Colorado at Union Station. The Crawford Hotel, inside Union Station, was created just a few years ago but you’d never know because it feels historic. When Union Station underwent a huge construction project in 2012-2014, part of the result is The Crawford Hotel. There’s an air of bygone times here, quite a feat by the architects and interior designers. The first time I stayed at The Crawford Hotel, I was on a magazine assignment for an article that I pitched to Colorado Life Magazine. Published in 2015, I proved that I could stay two nights at The Crawford Hotel without stepping a foot outside of Union Station. The station has everything you need to survive under one big roof including a hotel, restaurants and shopping. The hotel features tall ceilings and a collection of artwork like no other. This is one of my favorite aspects of the hotel and the art isn’t just in hallways but is featured in the rooms. Be sure to get a guide to the hotel’s art when you check in. The art sets a Colorado tone that can be felt throughout the property. Learn more about this the artwork here. There are a variety of rooms available at The Crawford Hotel. Most recently we stayed in a Loft Room with a pitched ceiling and raised bedroom area. A Loft Room is perfect for the night before boarding the ski train to Winter Park. 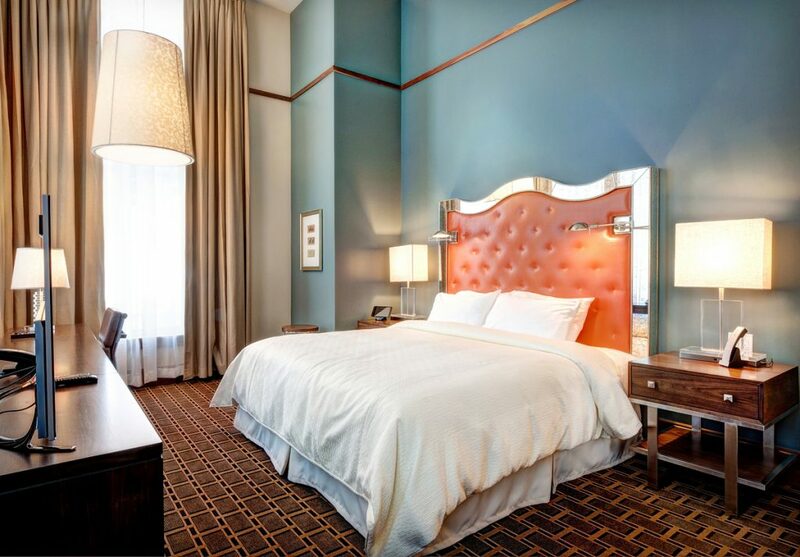 In the past, we’ve stayed in Classic Guest Rooms that are truly grand. With high ceilings and claw foot tubs, these rooms are fit for a queen, or in this case, the Mayor of HeidiTown. The hotel also features suites and Pullman Rooms which are designed with original Pullman Cars in mind making them the perfect place to stay during an outing inside a train station. The Crawford Hotel is located in the stories above the echoing noise of Union Station’s main hall. The station is eerily quiet in the wee hours of the morning but comes alive later in the day when people utilizing the station for Amtrak, light rail, shopping, coffee, a place to meet friends, or visiting one of Union Station’s wonderful restaurants. 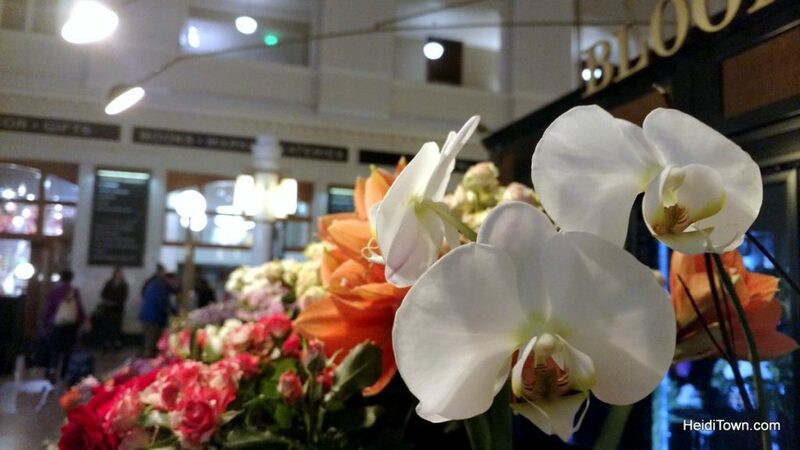 Many of the businesses inside Union Station offer discounts to guests of The Crawford Hotel. For instance, the Terminal Bar offers one free beer each guests of the hotel. The restaurant scene at Union Station is fantastic and I highly recommend breakfast at The Mercantile Dining & Provisions, specifically the Croque Madame. If you to eat breakfast earlier, go to Pigtrain Coffee Company for a quick, affordable and yummy breakfast sandwich. They also have excellent coffee. 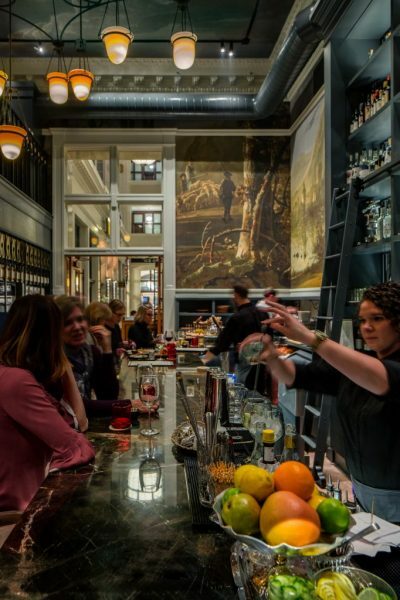 During our last visit in January, we dined at Union Station’s newest restaurant, Ultreia. They specialize in gin and ham so of course, I had to eat here. Ulreia translates loosely from Spanish to English as “have a good journey” making this train station-based restaurant aptly named. The interior of Ultreia is Old World with a modern twist. The walls appear to be adorned with fresco paintings from another age and yet the restaurant space feels moody and modern. At Ultreia we dined on a selection of items so delicious that it’s hard to pick a standout. They may be a delight for lovers of ham and gin but Ultreia has started fermenting all the things. 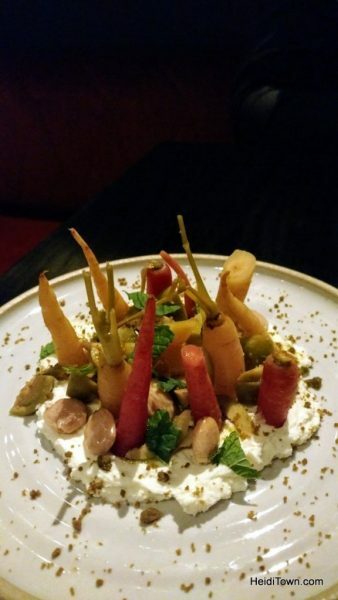 For instance, do your taste buds a favor and order the fermented carrots with olive oil labneh, almonds, olives and mint. We also had sardines on a stick, mushrooms in a foaming froth of scrumptiousness and sausages made in-house. Fermented carrots at Ultreia. I will crave these at least twice per month. We ended our meal with the Pastel de Nata, a traditional Portuguese custard tart. Do not discuss it, just order this dessert and thank me later. 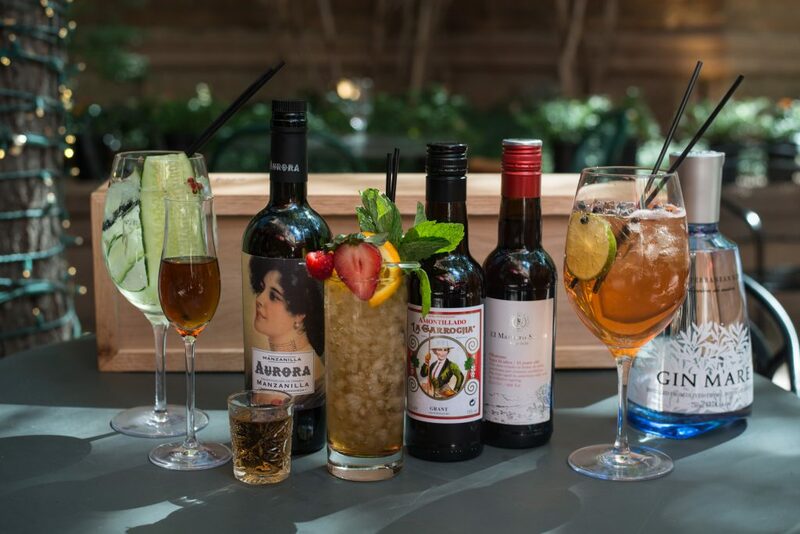 The staff at Ultreia is tops so be sure to tickle their brains about what to order when it comes to food and drink. They will not steer you wrong. The open kitchen means you might meet the chef too, so be sure to say “hi” and ask questions. 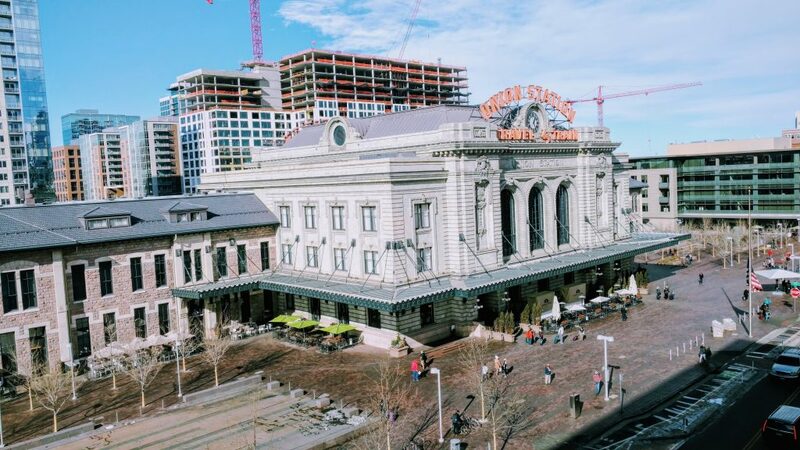 Whether you live outside or inside of Denver or in a different state or country altogether, an overnight at Union Station is not just something I recommend, I encourage it. For those who fly into Denver International Aiport, light rail runs directly from the airport to Union Station. 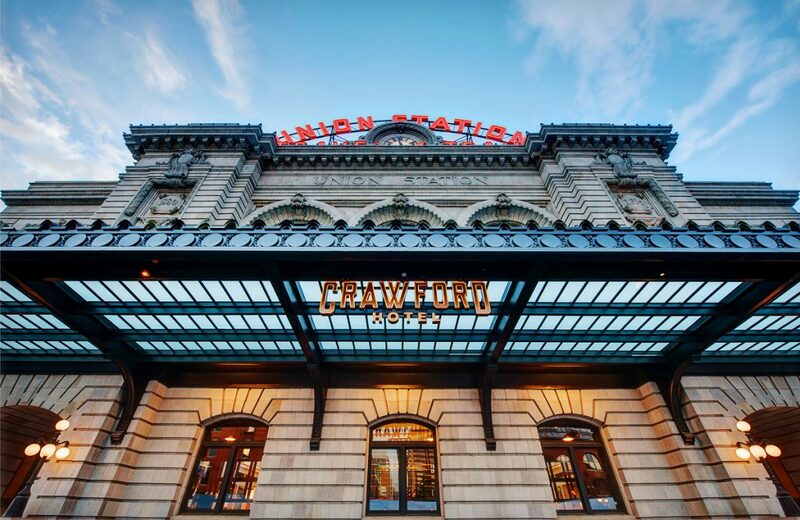 A stay at Denver’s Union Station is a truly different kind of travel experience because staying in a transportation hub gives the traveler a chance to enjoy the hustle and bustle without being a part of it. Thank you to both The Crawford & Ultreia for hosting our visit. I must say the food looks and sounds quite unique. I’ll have to visit next time I am downtown. I must say the food looks and sounds quite unique. I’ll have to visit next time I am downtown. Hungry just thinking about it.